Now that we are getting to know our way around a little better, let me tell you a bit about the town we will call home for the next 12 months. 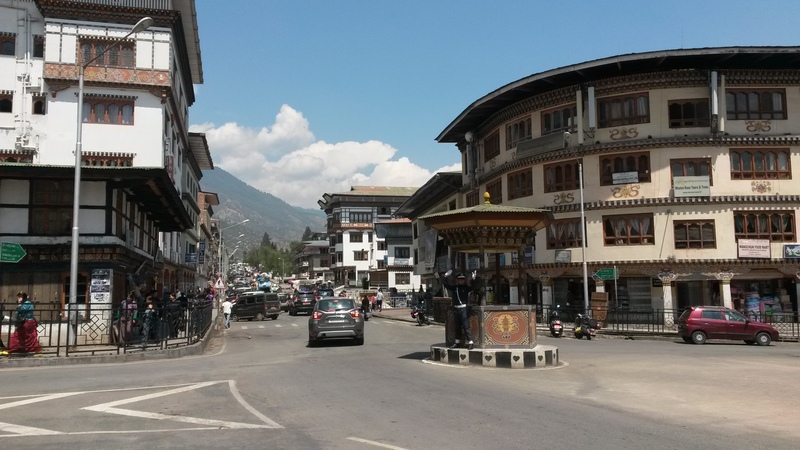 Thimphu, the capital of Bhutan, is situated in a valley that runs north – south. The bottom of the valley, where the Wang Chuu river winds its way southwards (eventually passing through India and Bangladesh and into the Indian Ocean), is at the same elevation above sea level as the top of Mt. Kosciuszko, Australia’s highest mountain! And the city steps up the sides of the valley from there. 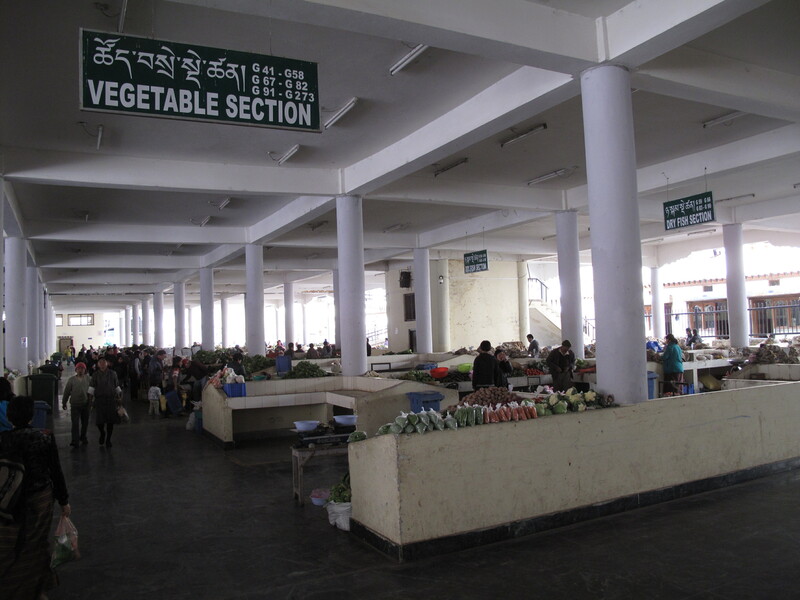 The weekend vegetable markets, the national football stadium and the Dzong (the administrative and religious centre) are adjacent to the river and the main street is a little higher up running parallel to the river. The centre of town is known locally as ‘traffic’ and refers to the roundabout which has a shelter in the centre of it for the legendary white gloved traffic cops who are stationed there to direct the traffic. They’re famous for their characteristic arm movements. 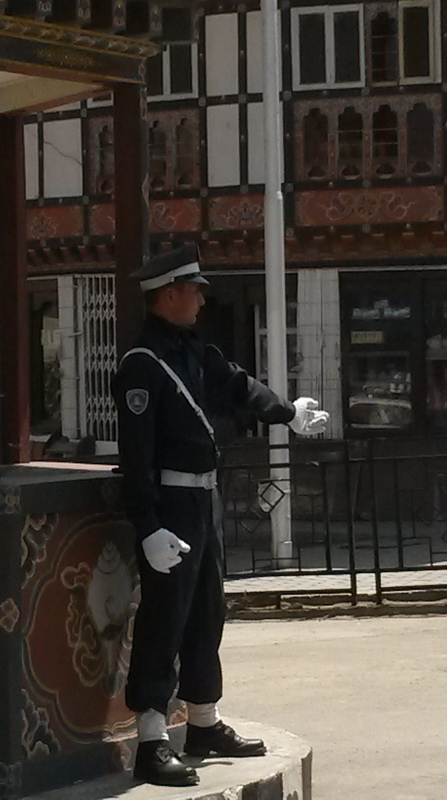 Some years ago, the first ever traffic lights in Thimphu were installed at this intersection, but they were deemed contrary to GNH and subsequently removed and the white gloved traffic cops were re-instated. The population is approx. 100,000 and growing rapidly as people move to the city from the rural areas for employment. As such, there is plenty of construction happening with new apartment buildings going up all over town. There are strict rules about maintaining traditional Bhutanese architectural features in new buildings – more on that at a later date. Consequently, by day the city hums with the sounds of construction work and by night, the numerous barking stray dogs take over. Putting our earplugs in before we go to sleep has now become second nature. But I’m sure that in time we’ll get used to it and no longer need them. I have to say though, as Asian cities (let alone capital cities) go, it’s by far the most peaceful and relaxed one I’ve been in! After our orientation week, we moved into a furnished 1 bedroom apartment that our In-Country Manager had lined up for us. It’s halfway up the western hillside at about 2,400m ASL. The hillside continues above us to 4,000m plus, covered in blue pine forest. The apartment faces south, looking down the valley, so gets the lovely sunshine throughout the day. The walk down the hill into town only takes about 10 minutes. 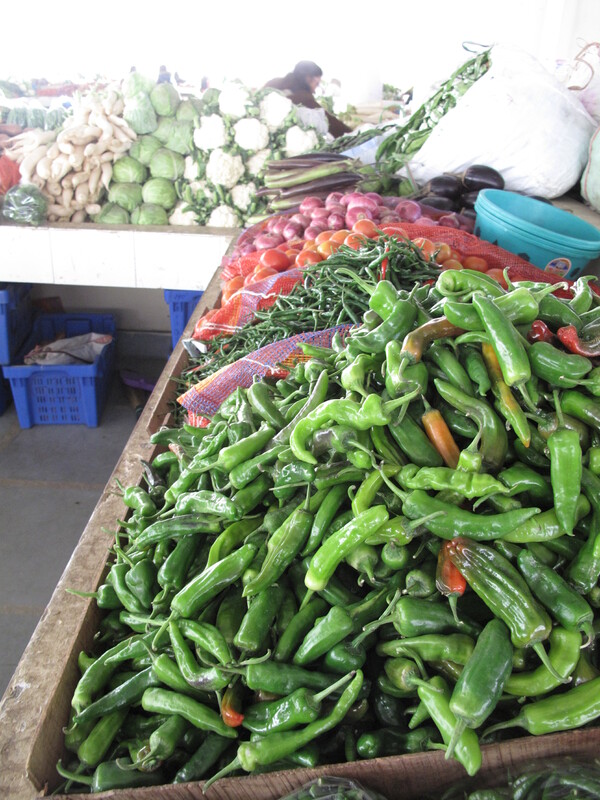 Then there are plenty of taxis available to drive us back up the hill with our bags of fresh produce, if we don’t feel like walking, for a set fare of 60 Ngultrum, (or AU$1.20). Over the last month, spring has arrived in Thimphu. The distant mountain peaks have lost their snow caps and the city is dotted with pink and white cherry blossoms. Asparagus has come into season and is in plentiful supply at the market. There’s been a handful of “t-shirt weather” days but 2 doonas are still required at night. Speaking of attire, the vast majority of locals going about their daily business wear the traditional Bhutanese dress, which is “Gho” for men and “Kira” for women. And in fact, for government workers, wearing the traditional dress to work is mandatory. While this is not enforced for “chillups” (foreigners), it is appreciated if they make an effort. The “Kira” is a full length skirt of your chosen fabric. The fabrics are beautiful and there is a vast array of colours and designs, and a vast range of prices from machine made to hand woven/embroidered. The fabric is wrapped such that you end up with a pleat down the right side and is held on with a belt around the waist (or you can cheat, as I did, and have it tailored so it just wraps around and velcros on!). It is worn with a loose blouse/jacket known as a “wonju/toego” which is often made from a shiny silky fabric in a colour to match the Kira. This is held together with a brooch at the front. The “Gho” is almost like an oversized dressing gown. However, it is tied in a certain way so that you end up with 2 pleats at the back, held in place with a belt around the waist and the folds of fabric form a handy pocket at the front traditionally for a wooden bowl and a small dager, but these days for your wallet, keys & phone. Needless to say, putting one of these things on requires assistance. So it has become one of my tasks to dress Jordi for work each morning! The first morning I think I finally mastered it on the 3rd attempt! As the days wore on, however, I got a bit sloppy and Jordi was recently teased about his Gho because the underskirt was showing below the overskirt – major fashion faux pa! So I take more care now! For formal occasions, such as visiting a temple or a Dzong, a special scarf is required. For women it is called a ‘Rachu’ and sits on the left shoulder and for men it is called a ‘Kabney’ and is like a pashmina that is draped around and over the left shoulder also, the colour of which signifies rank – white being for commoners. Jordi’s work is about a 10min walk from our apartment. He’s working in a team of 14 known as the Watershed Management Division within the Ministry of Agriculture, Department of Forests and Park Services. 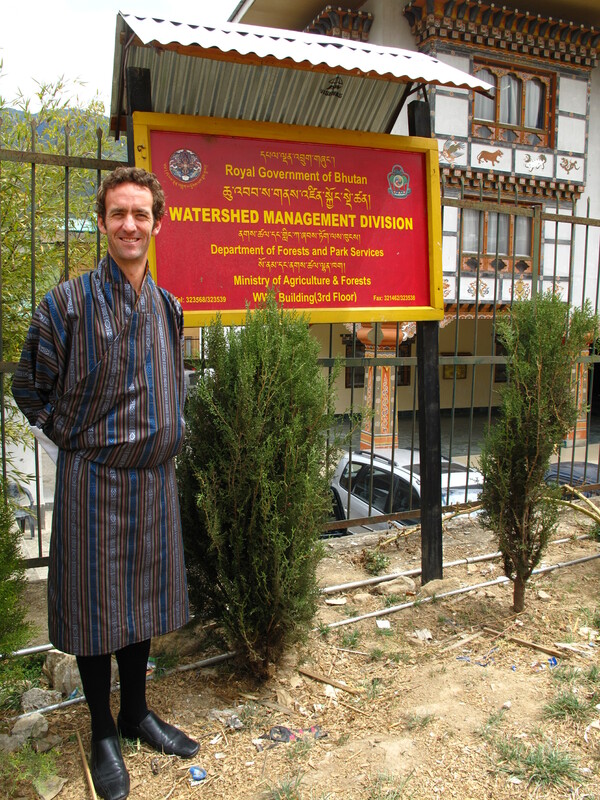 Essentially his role is assisting with the assessment of the country’s watersheds, and the development of Watershed Management Plans for the most critical ones. In this last week I think we’re finally starting to feel like we’re settling into life in Thimphu. 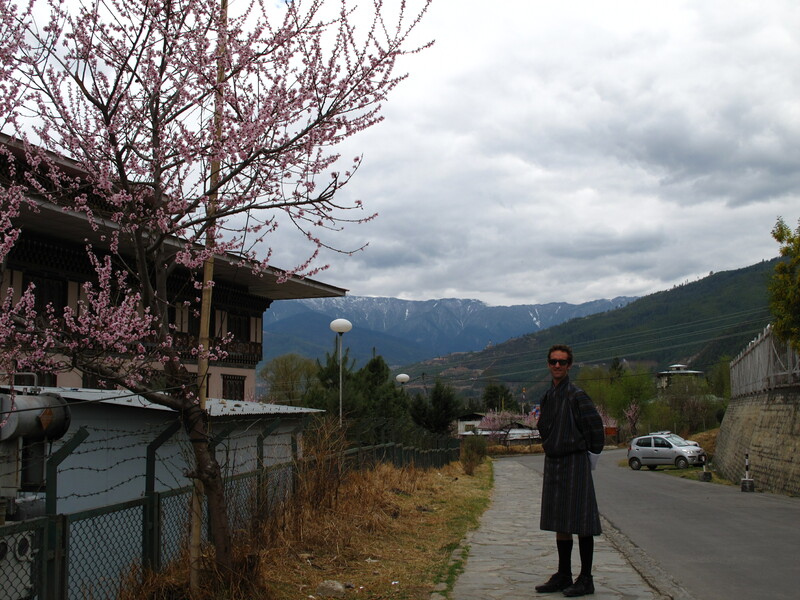 This Post was tagged Bhutan, bhutanese drink, Bhutanese National Dress, capital of Bhutan, Dzong, expat living in Thimphu, Gho, GNH, Gross National Happiness, Kira, spring in Thimphu, Thimphu, volunteer. Bookmark the permalink. Hi Jen, I’ve enjoyed both blog entries so far. Had to laugh out loud, thinking of Jordi’s petty coat sticking out under his Gho! Mwa.